When joining my organization as an apprentice during Amani’s Social Innovation Management Program, I honestly didn’t know what to expect and what type of job I would be doing. S3IDF is a not for profit organization that works with small and marginalised entrepreneurs from underserved communities, both from rural and urban areas. What they do is build and catalyse inclusive replicable market systems that promote equitable, economic and social development. Sounds complex right? Well, that’s because it is! It took me about a month to understand how the organization functioned, and there are still a few points I don’t completely comprehend. Working with S3IDF opened my mind to different types of organizations in the social sector. Their approach to helping these entrepreneurs is what I like the most about them. It’s not about donating money or simply giving these people loans, but helping them build a sustainable business model and getting them included in the market system. As a part of my apprenticeship at S3IDF in Bengaluru, I went on a field trip to the coast of the state of Karnataka, on the Arabic Sea. 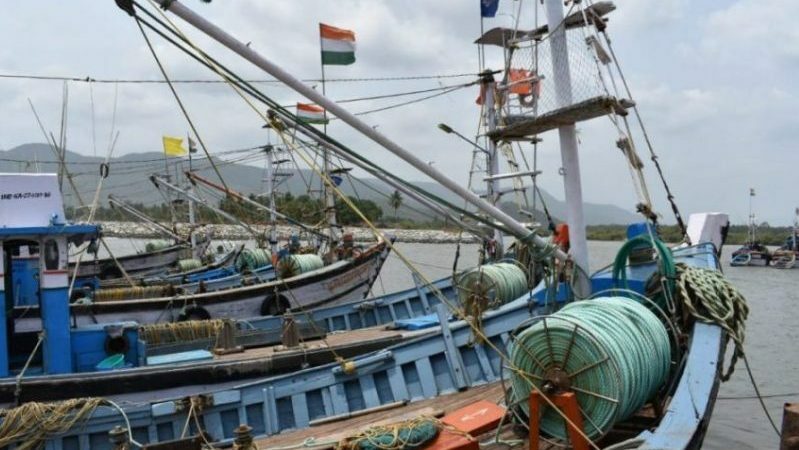 The purpose of the trip was to meet a few groups of fisherwomen at the beautiful localities of Kumta, Gokarna, and Ankola, about 470km from Bengaluru. Even though the name indicates it, these women are actually not fishing – as it is historically reserved for the men of the village. So, the women then sell the fish in the local market after the men catch them. As S3IDF is starting this project, our goal for our visit was to have a clearer view on what the most essential needs are regarding sourcing and marketing. We left Bengaluru on a Wednesday night on a rather comfortable sleeping bus, and while it was a really winding road we were able to get some sleep. I was traveling with two of my co-workers, Nitin and Tanmoy. We reached the centre of the small town of Kumta early in the morning and checked into our hotel to freshen up before starting the long day that was ahead of us. During our trip we were accompanied by members of a local NGO, Manuvikasa, who facilitated the meetings. After eating dosas for breakfast, we headed to our first stop, which was the beach of Kumta village. Our meeting with the group of fisherwomen happened right at beach, in a quite unexpected setup: our barefeet on the sand, the hot and humid air of the pre-monsoon season; the many canoes facing the indigo sea. Our afternoon meetings happened away from the shore, a couple of them in one of the women’s houses and another one in the backyard of a public school. The conversations were all happening in the local language, Kannada, and sometimes in the coastal dialect, Konkani, famous for being spoken in Goa, a neighboring state. The most important points of the conversations were then translated to English by one of our colleagues. In the afternoon, we had the opportunity to try some amazing fish thali in one local restaurant, with a sweet mango lassi! To me, the most interesting thing about the meetings was observing the characteristics of the group participants. Some women were getting their fish directly with their husbands, who spent the day fishing, and they would eventually sell them in local markets. Others were acquiring it directly from the harbour and then reselling it. The needs were also varying for each group, ranging from motorised boats to refrigerated vehicles to store the fish for longer periods. After a long day having covered over a hundred kilometres in the coast and having met 4 fisherwomen groups in 4 different localities, I took the bus back to Bengaluru so happy to have met these people and have learned so many things. One of the things I like the most about working with S3IDF is the opportunity I have to be in the field, talk to people and see their reality. The information you get meeting these small entrepreneurs in only one day is much more valuable than what you can acquire in one month of desk research behind your computer.